What will I gain from doing the Natal Hypnotherapy Classes? Most antenatal classes cover a wide range of information based topics such as what will happen during birth, all the procedures and protocols of our modern maternity system, pain relief options, breastfeeding, baby care skills, early days as a parent etc. The Natal Hypnotherapy classes focus exclusively on emotional and practical preparation teaching you what you can do to help yourself have the most positive birth experience, regardless of the type of birth you are planning. The classes teach you in depth skills to prepare yourself mentally, emotionally as well as physically for the birth. Whether you want a natural water birth at home or are open to having an epidural in your local hospital, what you learn on these classes will give you the confidence and ability to work with your body no matter what your birth choices are. The first of the 2 day classes is on"Natural Pain Relief" and focuses very much on your mental preparation for birth, again an area often missing on other courses. It helps you address and overcome any fears, teaches you how to relax and use your breathing effectively and helps you understand why and how these things are so important. The 2nd day is the "Practical Birth Preparation" class which teaches you and your partner simple, effective and practical tools and techniques to stay calm, relaxed and confident as well as helping you understand the physical as well as emotional map of birth. The emotional map is one which very few other courses touch on and yet for hundreds of couples who have done this course, they feel that this was one of the most important things they learnt. Natal Hypnotherapy run 16 hour classes for parents geared towards empowering and preparing them emotionally as well as physically for the birth. It is recommended that couples do both classes which can be taken at any time during pregnancy, however ideally it will be between 25 and 35 weeks. Each couple is sent pre-class questionnaires to fill out, to help the practitioner gain a clear understanding of your hopes, fears and any specific issues. The class is then specifically tailored to the needs of each couple. Classes can be taken as an individual or as a couple, however it is extremely useful for a birth partner to attend as many techniques work best when a birth partner is involved. The teaching approach includes the use of PowerPoint, videos, interactive sessions, group work, couple work and hypnosis relaxation sessions. 8. Ways the birth partner can help the woman achieve a deeply relaxed state before and during labour. 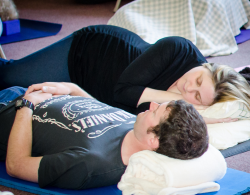 The 16 hour courses cost from £220 to £320 per mum-to-be and birth partners attend for free! Included in the price are 5 Hypnosis downloads including one specifically for the Birth Partner and a pdf of Maggie Howelll'sEffective Birth Preparation Book . Please click here to find a class near you. You can read about our different practitioners and the locations they teach in by clicking here. Once you have decided where and which practitioner you would like, you can click on the buttons to make an enquiry and leave your details so they can get back to you. Once your enquiry has been received you will receive an email with the further information and contact details of your practitioner. Your practitioner will then take your booking, provide you with pre course questionaires for you to fill out and return to your practitioner. This will be treated with complete confidence and will help your practitioner ensure that all your needs are met on the class. Two weeks prior to your course, you will be contacted again by your practitioner to confirm all details and to discuss any specific concerns or issues. You will receive a coupon code after the class which can be used to download the hypnosis tracks and the book. All bookings are taken directly by practitioners - please look at the column to the left to find your nearest practitioner. Then contact them directly via the links for dates and booking. All workshops are taught by licenced, qualified, insured and regulated Natal Hypnotherapy practitioners. You will find your unique coupon code inside the Natal Hypnotherapy Resource Book. If you do not have a unique coupon code please contact your course practitioner.